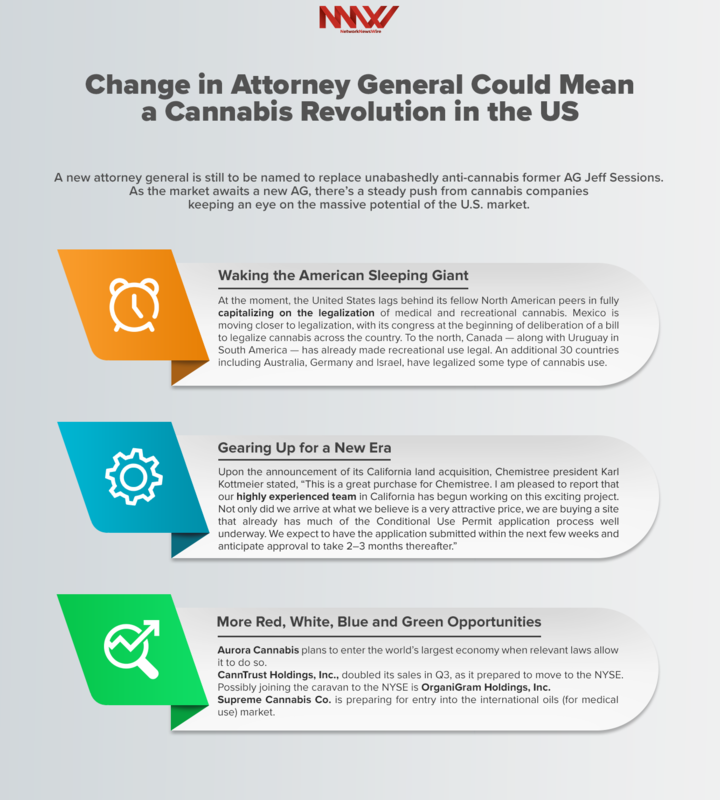 CannabisNewsWire Editorial Coverage: A new attorney general is still to be named to replace unabashedly anti-cannabis former AG Jeff Sessions. As the market awaits a new AG, there’s a steady push from cannabis companies keeping an eye on the massive potential of the U.S. market, companies that include Chemistree Technology, Inc. (CSE: CHM) (OTCQB: CHMJF) (CHMJF Profile), Aurora Cannabis (TSX: ACB) (NYSE: ACB), CannTrust Holdings, Inc. (TSX: TRST), Organigram Holdings, Inc. (TSX.V: OGI) (OTCQX: OGRMF), and Supreme Cannabis Co. (TSX.V: FIRE) (OTCQX: SPRWF) (SPRWF Profile). By the end of 2025, the legal cannabis industry is expected to reach $146.4 billion worldwide. Meanwhile, a good number of U.S. companies and investors are being mostly locked out of this booming market because the federal government still classifies cannabis as a Schedule I drug. However, a sea change of public opinion pointing towards a demand for federal legalization is underway with several states already having voted in favor of cannabis in some form. Even the notoriously conservative, teetotalling state of Utah has joined this revolution. What’s on the table is a massive multibillion-dollar sector that could be unleashed quite quickly should the next AG have a softer and more populist approach to the plant. During the lead-up to a potential legalization, companies large and small are staking their ground in lucrative U.S. regions already brimming with a willing clientele eager to buy legal cannabis. California alone could bring about a green wave, boasting an existing cannabis market larger than all of Canada combined. Chemistree Technology, Inc. (CSE: CHM) (OTCQB: CHMJF) has already begun setting up shop in the Golden State, having recently solidified a land purchase of 9.55 acres in California’s prominent Desert Hot Springs’ cannabis cultivation zone. Chemistree’s strategic move into California is representative of an early-mover advantage, despite the state’s already booming cannabis sales. California’s cannabis spending hovered near $3 billion in 2017 — even before recreational marijuana became legal on January 1. By 2022, the market in the state is expected to soar to $7.7 billion. In spite of the legal limbo of cannabis in the United States, the sector’s advantage may already be moving south from Canada into its neighbor to the south. Ahead of the new AG announcement, it appears the U.S. opportunity may have already arrived. Combined, the top U.S. cannabis firms trading on Canadian exchanges represent $8 billion of market value—or roughly 20 percent of the billion-dollar market capitalization of the 144 cannabis companies listed in Canada. This just scratches the surface. At the moment, the United States lags behind its fellow North American peers in fully capitalizing on the legalization of medical and recreational cannabis. Mexico is moving closer to legalization, with its congress at the beginning of deliberation of a bill to legalize cannabis across the country. During his election campaign, Mexican president-elect Andrés Manuel López Obrador signaled his willingness to consider legalization. Then last week, the country’s Supreme Court ruled that anti-cannabis laws are unconstitutional, forcing lawmakers to decide how to regulate its use. To the north, Canada — along with Uruguay in South America — has already made recreational use legal. An additional 30 countries and 33 U.S. states, including Australia, Germany and Israel, have legalized some type of cannabis use. Those numbers are growing. More than a dozen countries have already started on the path to full legalization of the plant. Following the resignation of AG Jeff Sessions, Sessions’ chief of staff, Matthew Whitaker, is presently serving as acting attorney general. Media outlets are speculating who the next AG could be, with New Jersey Governor Chris Christie and Florida AG Pam Bondi leading the way as potential candidates. While Christie has been adamantly anti-pot in the past, Bondi oversaw the approval of medical marijuana in her state of Florida. A Bondi nomination, coupled with strong public support could ultimately be a major boost for the cannabis sector. Cannabis companies are already getting their ducks in a row for a new era of legalization. With operations in Washington State and now California, Chemistree is gearing up for a big move. The property is capable of supporting development plans and a Conditional Use Permit application for three 68,000-square-foot cultivation and processing buildings on the site, totaling approximately 205,000 square feet. Earlier in the year, Chemistree purchased the high-quality, Washington-based Sugarleaf brand with the expressed intent to more than quadruple the reach of its product line through 2019. By taking Sugarleaf’s brand reach across state lines into California, Chemistree is pairing the new brand with its already acquired assets. Beyond cultivation and branding, Chemistree is also expanding into Northern California. The company has entered into a joint venture on a cannabis processing facility in the north, while also seeking capital to expand locations in the state and broaden its service offerings. Having recently spun off its American assets into Australis Capital, multinational cannabis producer Aurora Cannabis (TSX: ACB) (NYSE: ACB) plans to enter the world’s largest economy when relevant laws allow it to do so. While Aurora currently has no direct ownership interest in Australis, the company holds two warrants that would allow it to acquire an ownership interest in Australis if holding investments in U.S. cannabis assets becomes permissible within a decade. In the meantime, Aurora has successfully listed itself on the NYSE. Soon to be following in Aurora’s NYSE footsteps is CannTrust Holdings, Inc. (TSX: TRST). CannTrust managed to double its sales in Q3, as it prepared to move to the NYSE. While still early in the game, CannTrust delivered sizeable sales growth, and nominal profits. It entered into supply agreements with nine Canadian provinces to supply recreational cannabis across Canada. The company recently launched its fourth recreational brand named “Peak Leaf,” started shipping cannabis oil to Denmark and entered into an exclusive partnership agreement with Kindred Partners, Inc. Possibly joining the caravan to the NYSE is OrganiGram Holdings, Inc. (TSX.V: OGI) (OTCQX: OGRMF). With a market cap around $600 million, OrganiGram is likely a suitable choice for listing on the NASDAQ exchange, but it could also potentially fit on the NYSE. When it’s finally to scale, OrganiGram will likely be one of the 10 largest cannabis producers in Canada. However, an opening up of the U.S. market would only serve to boost OrganiGram’s already impressive growth curve. While not actively operating in the United States, Supreme Cannabis Co. (TSX.V: FIRE) (OTCQX: SPRWF) is preparing for entry into the international oils (for medical use) market. Through a partnership with Medigrow located in Lesotho, Supreme is looking to secure international opportunities including Medigrow’s 40,000 litres of cannabis oil potential per year. A loosening of U.S. drug policy could allow groups such as Supreme to import their wares from abroad into the United States and get involved in what could be the largest cannabis market in the world.